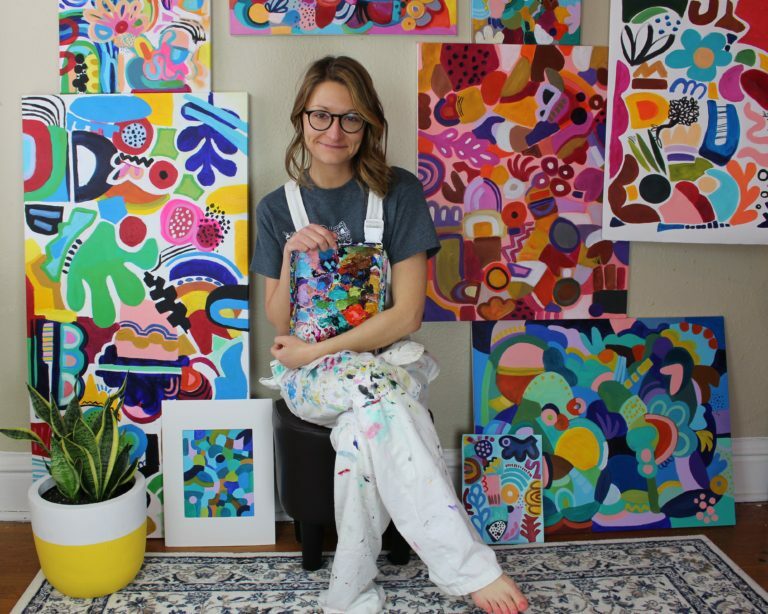 Artist Jessica Hitchcock paints from her home in St. Louis, Missouri, and it’s her bold colors that give her a signature look. 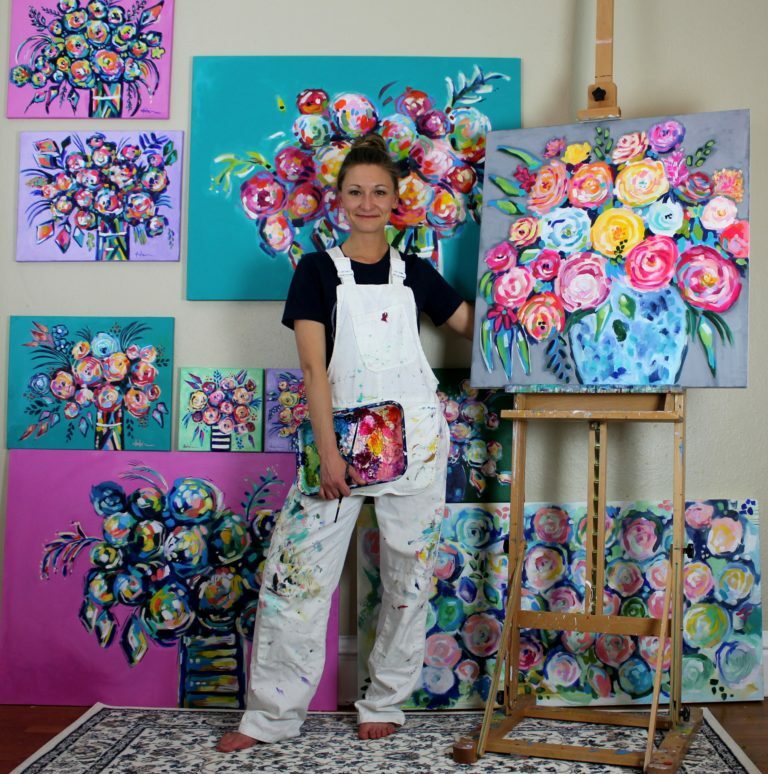 She only recently quit her day job to devote her efforts full-time to her art business. 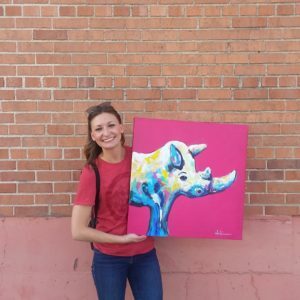 Following a recent trip to Mexico to work with an expert to plan her new business and her year, she’s off to a great start selling her art and getting her name out there. 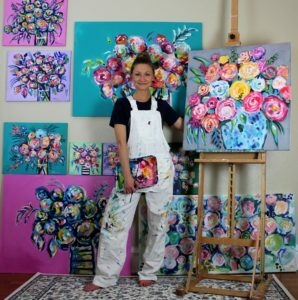 She works hard to be known in her community, whether attending art shows or doing live painting at events. She’s also actively engaged with others through Instagram and Facebook. 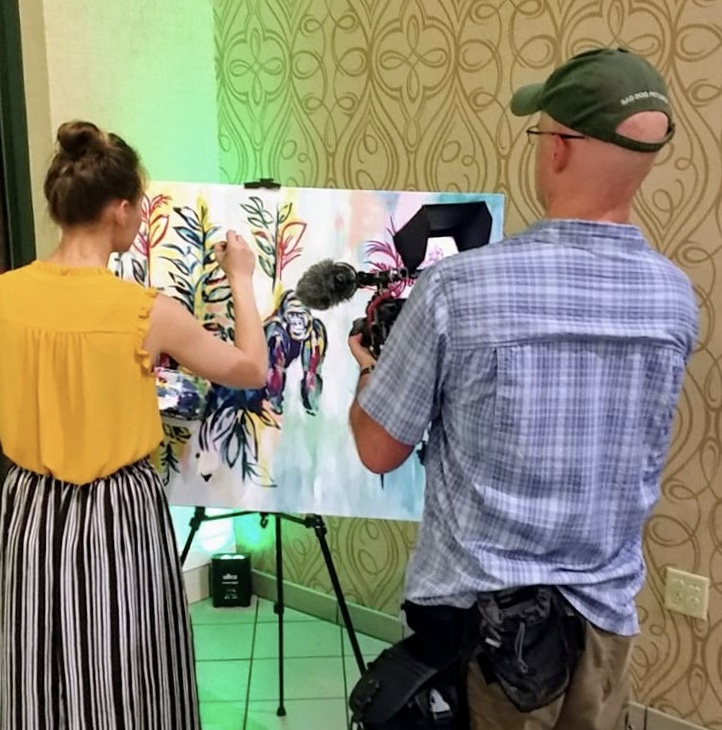 Jessica enjoys live painting events. 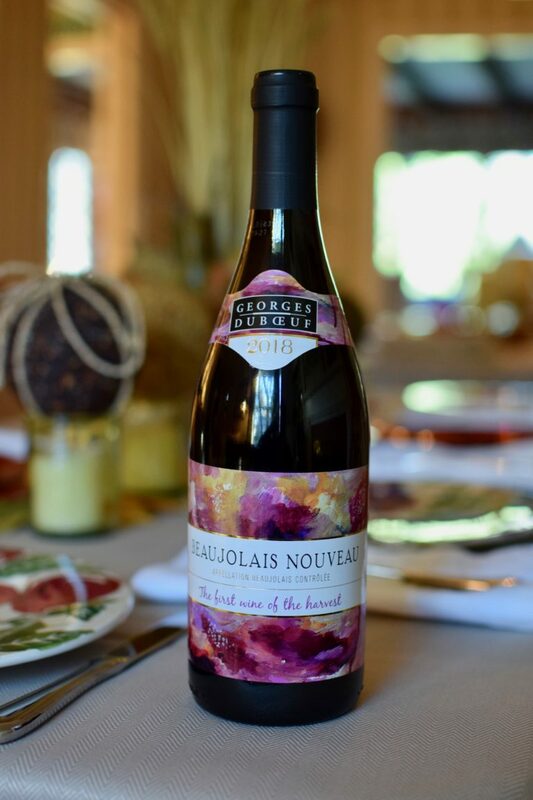 Jessica had her artwork on a wine label that was sold through Costcos all over the U.S.
Live painting at the Wall Ball event. You can sign up for her newsletter list right on the front page of her website. 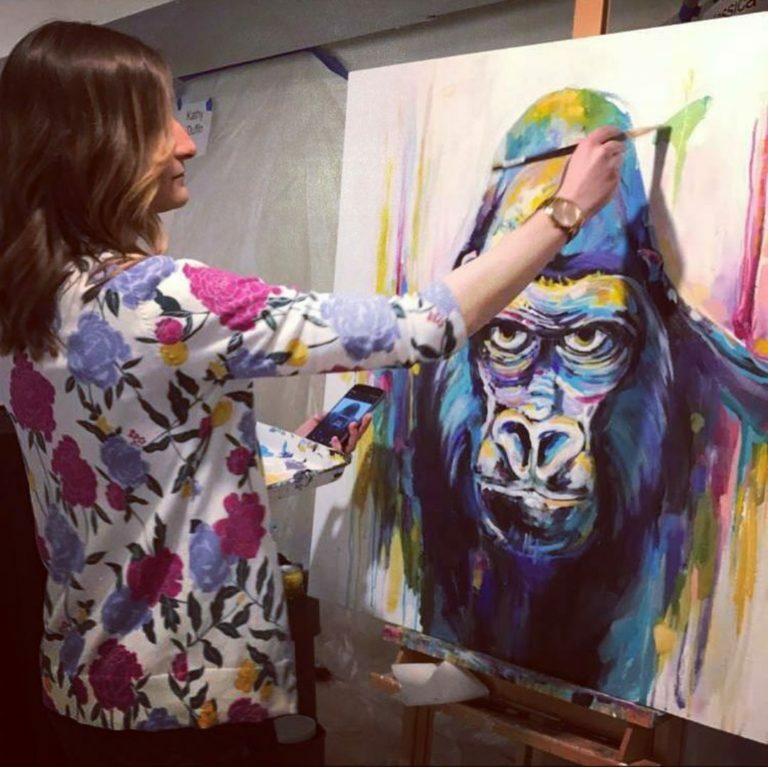 You can see where she is showing her work or doing a live painting event on her Events Page. Jessica traveled to Mexico to work with Desha Peacock. 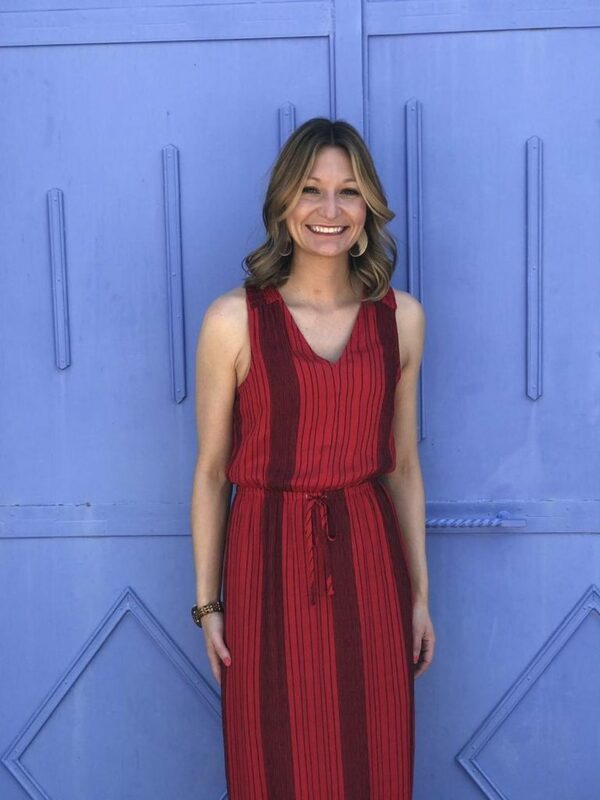 You can visit her website Sweet Spot Style to find out how she works with creatives like Jessica. 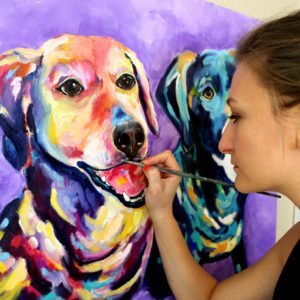 Jessica recommends that when you’re first wanting to get into your town’s art scene, visit art receptions, so you can see how shows are run, you can meet other artists, and ask questions about their businesses. It’s a great way to find out about art opportunities and start getting your name known. Look up hashtags on Instagram to find out what’s going on in your town. You can also use a hashtag like #yourtown artist when you post your work. That way when people are looking for local art, they can find you. A lot of artists have the community over competition attitude, meaning they are very supportive of one another. It’s great to share what we know with one another so that we will all rise. Jessica credits Instagram with being a huge reason she is a successful artist. Every artist should develop a newsletter list so that they can control their contact with their customers just in case things change with the social media platforms. 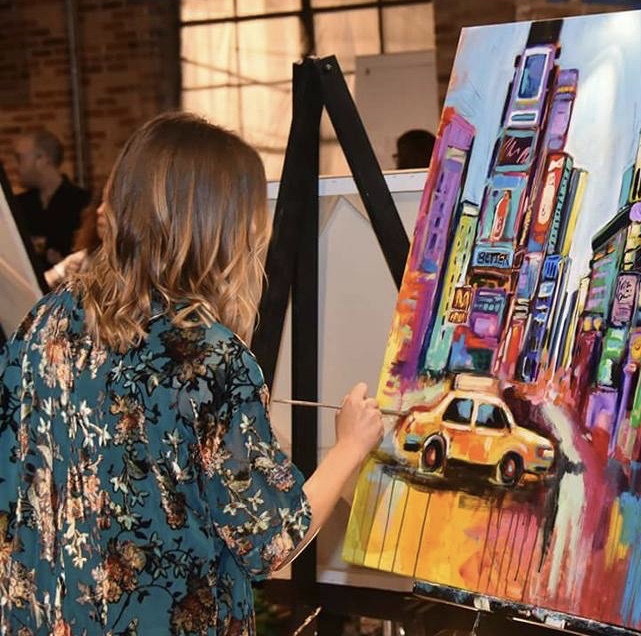 Your art business income should come from many revenue streams, so explore the opportunities that are out there and find the ones you’d like to pursue. If you’d like to offer prints, ask around to other artists and explore your options locally. You may be able to find a fine art printer who can scan your large pieces and print them on your paper of choice. Jessica has also found that her printer can resize her photos for her, so she doesn’t have to do that part. Let people be a part of your process of making art, by posting photos and videos of you starting a piece, working on a piece, and finishing a piece. Utilizing the stories feature on Instagram adds a personal touch and allows people to really get to know you more.